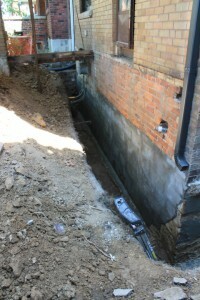 Basement Underpinning Toronto: The basement may not be the most attractive feature of the home, but it is the most important. Without a strong foundation, that deluxe custom kitchen, gorgeous hardwood floor, and beautiful bedroom isn’t going to last as long as it should. A faulty foundation puts pressure on the upper structure, distorting your home’s beauty. Weather – Earthquakes, floods and natural wear-and-tear have damaged or degraded the foundation. Home Addition – Maybe you’ve added an extra floor or room to your home. That puts additional weight on the foundation, and you may need to strengthen the basement in order to support the new weight. Nearby Structures Have Changed – Large construction developments can shift and displace the earth in a wide area. If you live near a large development, there may be additional pressure on your home’s foundation. Consider underpinning. Proven Process – Our certified construction professionals specialize in performing excellent basement underpinning work. Depending on what your needs call for, we can expand the foundation to better distribute your home’s weight, strengthen it with micropiles and jet grouting (which strengthen the soil surrounding the home), or apply urethane-based engineered structural resins. Excellent Employees – We’re one of the leading construction firms in Toronto in large part because we hire only the best available personnel. We uphold strict work standards, hiring only the best-qualified tradesmen and project managers. Our teams also place a premium on finishing work promptly and within budget. Fully-Licensed and Insured – We hold all of the licenses required by the government of Ontario and are covered by 5 million dollars in liability insurance. Just as importantly, we’re members of the following business associations: Reno Mark, BILD Building Industry and Land Development Association, Construction Safety Association of Ontario and the Better Business Bureau of Mid-Western Ontario. We do excellent work, and have the references to prove it! Excellent Service and Warranty – At Integrity Contracting, we’re confident that you’ll be fully satisfied with your basement underpinning. But in case you aren’t, we guarantee all work for up to two years from completion. That’s right; if you’re not happy, we’ll take care of it at no extra cost. We also pledge to maintain a clean and organized work site, answer all phone calls within two business days and provide detailed contracts for all work provided. If you’re looking for a local home addition contractor in Toronto to perform a basement underpinning, look no further than Integrity Contracting. We perform excellent work at competitive prices and provide a very competitive warranty. Why not give us a call today at 647-738-4395? Visit us on Google+.